Roland Champagne Vinegar is prepared by fermenting wine until it becomes sufficiently acidic. It is mild and versatile, perfect for use in marinades, salad dressings and sauces. Roland Champagne Vinegar pairs particularly well with seafood dishes. It can also be combined with Roland Smooth Dijon Mustard, Roland Olive Oil, and fresh herbs to create a special vinaigrette. 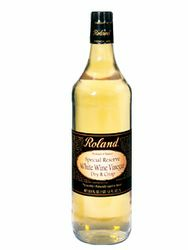 The Roland Special Reserve White Wine Vinegar is the top vinegar for my nightly salads. I have used it for a number of years now and really like the mild but tangy flavor it adds to pretty much any vegetable-based salad. Highly recommended. This is an excellent white wine vinegar for everyday use in cooking or salads. I use it on salads regularly. The taste is very pleasing and light, much more to my liking than the standard red wine vinegar, and the price is quite reasonable compared to much more expensive gourmet white wine vinegars which do not seem to have that much better of a flavor.